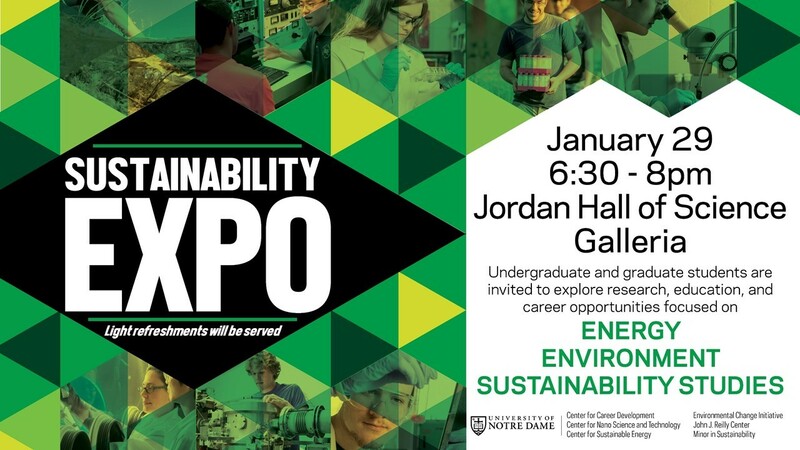 Due to the University’s weather closure, the Sustainability Expo has been canceled from Tuesday, January 29, and rescheduled to Monday, February 11. New this year, employers on campus for the Career Fair have been invited to participate in the Expo to provide students with internship and potential job opportunities outside of the local area. In addition, students will connect with researchers, educators, and community leaders on opportunities in research, education, and outreach programs and services, which are all important to enhancing graduate and undergraduate education. STUDENTS: Mark your calendar and view the list of participants below! If you are a faculty member or employer and would like to participate in this event, please contact Barbara Villarosa at bvillaro@nd.edu.